In this article, I share my recent experience in data-driven debugging. Data-driven debugging is the practice of using data to trouble-shoot software defects efficiently. It is not a new idea at all. In fact, most software engineers do it already. But I think we could practice it more consciously because it may work to cut the debugging of complex systems from days to a few hours. Consider a pair of devices at a store like Walgreens. One is facing the cashier and the other is facing the customer. As the cashier processes the purchase, relevant information is displayed on both devices in different presentations to aid the communication between the customer and the cashier. Such a system can be built with two tablets and a web socket server as shown in Fig. 1. Because the cashier-side tablet (Tablet B) needs to process some kind of transaction, it sends Application Programming Interface (API) calls to the API server that reads and writes data to the database.1 The web socket server also uses the same API and database to retrieve information about the mapping of device pairs so it can handle many pairs in different stores. 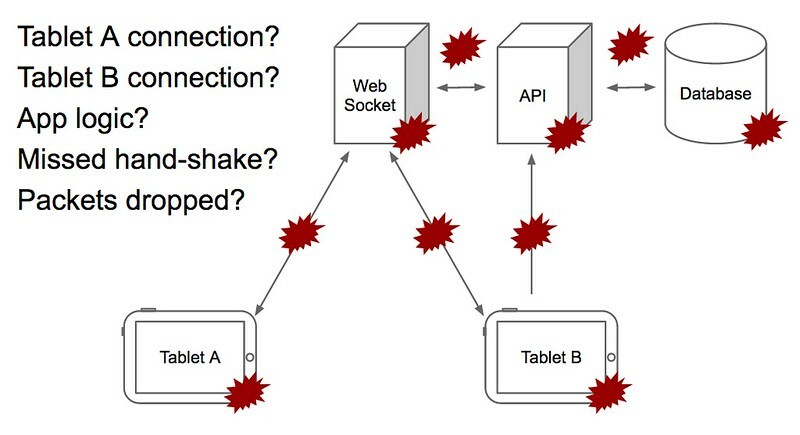 Figure 1: Paired tablets communicating via web socket server with potential points of failure highlighted by red "bangs". Many points of failure, so a large hypothesis space. This is a fairly complex system. Each component from the tablet to the database is subject to a logical failure, and each line of communication is also a point of failure. If we get a report from the customer support team that many tablets stopped talking to each other, what would we suspect? Was Tablet A not recovering the web socket connection after boot? Was Tablet B not recovering the web socket connection? Both tablets are connected to a web socket but is there an application logic failure preventing the correct information from being displayed? Did one of the pair miss the handshake signals from the other? In a complex system, the number of failure scenarios (or hypotheses) dramatically increases (i.e. the number of nodes plus the number of edges connecting them). Investigating just one of the hypotheses could be a lot of work. It could easily take days to get to the bottom of the issue if we exhaustively investigate one hypothesis after another. Reduce the hypothesis space based on the evidence. So, it is necessary to reduce the hypothesis space before jumping into the code-level investigation. Analyzing logs will help to achieve it. Luckily, in our hypothetical case, we have a log from the web socket server. After extracting the portion of the logs relevant to the affected store and date, we may notice a pattern as shown in Fig. 2. At the beginning, there was an existing connection from both Tablets A and B to the web socket server at 18:05:45. A mapping between the tablets was created just after the connection opened at 18:06:40. Then a strange thing happened. There was another open connection event by Tablet A. This is odd because there wasn't a "close connection" event log before this. It seems that there are two open sockets for Tablet A at 18:22:56. What happened next was Tablet A closes the connection just after receiving a handshake message from Tablet B at 18:22:57. But strangely, Tablet A still sent a message at 18:22:58. So, Tablet A wasn't disconnected after all? Store Wi-fi was weak as often happens in the local retail store environment. Suddenly, the weak signal caused the socket of Tablet A to disconnect in an unclean way. So, the disconnection wasn't recognized by the web socket server immediately. Tablet A, regaining the Wi-fi signal, sends a socket open request to the web socket and it is accepted. When Tablet B sends a handshake signal, the disconnection of the previous (and lost) socket (I call this a zombie socket) was finally recognized by the web socket server. In this software, the mapping information between Tablets A and B is removed upon the closing of the socket. So, when the zombie socket was finally reaped, the server removed the mapping information even though another live socket still existed for Tablet A. As a result, the socket for both tablets existed, but the mapping between the two was broken. This turned out to be exactly what was happening, and we could fix it quickly. Even if this had not been the case, we could rule out many scenarios that do not conform to the evidence from the log. Try reducing the hypothesis space first based on evidence when debugging a complex system. Make sure that the application logs at each critical step. Send the client log to the server. The second example is about data discrepancy between systems. Suppose we need to send the account information on the proprietary database (SQL) to Salesforce so that the sales department can use it for sales and customer retention efforts. One day, we receive an email saying that the data in SQL and Salesforce have a discrepancy. We first need to investigate by comparing the data between the two sources. This case is not so much about reducing the hypothesis space. Instead we needed to carefully compare the data between two systems: SQL and Salesforce. What tool do we use to start analyzing? It may sound very strange to application programmers, but my choice was R. R has packages to connect to an SQL server as well as Salesforce. 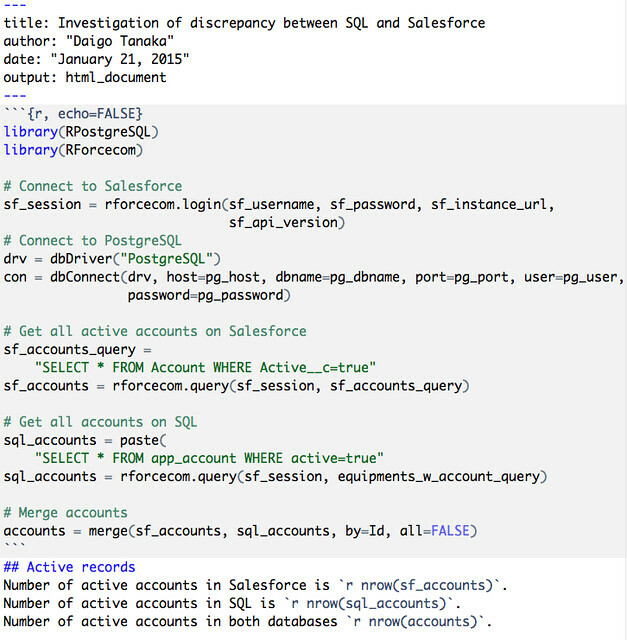 So without hopping from one console to another, I can send queries to both SQL and Salesforce. I can load the data on the data frames and join them to analyze in an integrated environment. Figure 3 shows a very simple code example to fetch data from both sources and merge them. Figure 3: R has packages to fetch data from various sources. R-markdown lets us document as we analyze for reproducibility. Documentation is the key. The key is to do it painlessly. In the course of data analysis, we can easily make mistakes in writing complex queries. A wrong query leads to wrong data. Wrong data leads to the wrong conclusion. It is very important that we can revisit the steps of the analysis later and get it peer-reviewed. It is therefore very important that the queries we write do not get lost and that we have clear documentation for others to review and to reproduce the analysis. However, I find documenting to be very hard if I do it as an independent task after the main task is done. I easily forget the details of the thought process. I lose momentum for executing the task once I think I have seen the result. Number of active accounts in Salesforce is 1251. Number of active accounts in SQL is 1328. Number of active accounts in both databases 1237. All the data (i.e. the number of accounts) is "soft-coded" and compiled upon the conversion from R markdown to a human readable document format (e.g. HTML, PDF, and etc). The whole text in R markdown is the source code to reproduce the analysis and generate the report. So, R markdown lets us document everything we do as we do it. In enterprise solutions, we often have to deal with the data from multiple sources such as SQL, Salesforce, logs, NoSQL, and so on. Having to hop from one console to another just to retrieve the data is disruptive to the analytical thought process. As the analysis gets complex, we will make mistakes in writing queries and code to transform data. Leaving the code to reproduce and document the steps of analysis is critical. Have an integrated data analytics environment that can load and merge data from multiple sources. Do not use graphical use interface (i.e. mouse clicks and spreadsheet program) as it does not leave clear steps of the data retrieval and transformation at the end of the analysis. Find a tool that documents the analysis at least semi-automatically for reproducibility and have the analysis peer-reviewed. In this article, I advocated the thought framework of Data Driven Debugging. When troubleshooting a complex system or doing a data intensive analysis, we should try reducing the hypothesis space with evidence (e.g. logs) before jumping into code when we troubleshoot a complex system. In enterprise solutions, we should be ready to deal with data from multiple sources. Having an integrated environment reduces the disruption to the analytical thought process. As the analysis gets more complex, it is also crucial to get our analysis peer reviewed. Tools such as R-markdown to semi-automatically document as we run the ad-hoc analysis facilitates the process. Thanks to dzs for correcting grammar and giving suggestions.